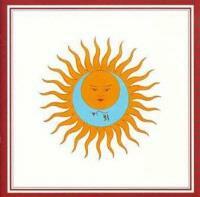 This album is kind of a legend in King Crimson circles. People have such a high reverence for it. To me some of that reverence is a little misplaced. Don’t get me wrong there is some great music here. Nothing is really bad either. The thing is, there are plenty of instances on the disc where it feels like they’ve taken purely unrelated musical ideas and run through each of them one after another and called it a track. Also this feels a bit too sedate for my tastes. I like the disc, but really I think it pales behind both of the other albums to feature essentially the same lineup Starless and Bible Black and Red. Basically the first three minutes of this are taken up by a percussion solo. Mind you, it’s not the type of thing you’ll think of by hearing that. We’re talking ambient percussion, tuned percussion, chimes and the like. From there they fire out into a crunch-fest jam that has as much to do with “21st Schizoid Man” as it does with the sounds the group would later produce. We get stomping metallic jams on this in the style of that early song, but we also get symphonic music. This is a startling juxtaposition of noisy periods set off by mellow beauty. They take us through a series of changes and alterations. If you don’t like where the track is at, just wait a little while – it will change. In many ways you could look at this as a series of short form musical concepts strung together. At over thirteen and a half minutes in length, disjointed that it might be it’s also the longest track on show here. For my money the most effective portion of this track is the killer closing section. It has a wonderful musical texture to it. This is a gentle and pretty song that’s essentially a ballad with elements of jazz and classical music serving as the icing on the musical cake. Noisy sounds – far back in the mix, though, lead this off and hold it for a time. Eventually a symphonic sort of melody begins to rise upward gradually. Rather than fully taking over, though, they change gears completely and take us out into a very classically inspired melodic movement. This is beautiful and serves as the backdrop for John Wetton’s vocals. After this section they turn this out towards symphonic drama. They eventually pull this through several changes and again I find the closing sequence to be the most powerful – although the whole piece works very well. It’s somewhat disjointed, but seems more coherent than the album’s opener. Here we get the most “song like” track on show here. Well, the other contender is “Book of Saturday.” This is a great rocker and it’s quite coherent and consistent. They still manage to pull it out into some cool instrumental explorations. To me this is one of the highlights of the disc. It has a lot in common with the Starless and Bible Black album. This starts off slow and builds very gradually. It’s another instrumental, but it’s more cohesive than some of the other ones on the disc. This track might take a little while to find its power, but when it does it really rocks. There are hard rock elements and bits of jazz and a lot of classical in the mix. This is another highlight of the album. When people think of this album the opening riff of this is probably one of the first things they think of. This is actually another strong piece of music. Another instrumental it has a lot in common with Red. It alternates between hard edged crunchy driving sounds and more classically oriented mellow textures. They do work through a series of changes and alterations on this one, but it’s more coherent than the portion that opened the disc. It’s also only a little over half the length of that track, too.